Abstract: Leonardo Bruni’s aim in the De militia (ca. 1420) was to co-opt the most glamorous of medieval ideals, the ideal of chivalry, and to reinterpret it in terms of Greco-Roman ideals of military service. In so doing he aimed to make the reform of knighthood in Renaissance Florence into an aspect of the revival of antiquity. Introduction: In the comic tales of Franco Sacchetti, the trecento novellista, there is a story (no. 150) that shows with great vividness how Florentines of the early Renaissance viewed the knighthood of their time. A knight of the Bardi family has been chosen as a judge (podestà) in the city of Padua. He is a tiny man, unmilitary in his habits, and an indifferent horseman. To give himself a more impressive appearance, he decides to wear a magnificent crest on his helmet, consisting of a bear rampant with drawn claws and the motto: “Non ischerzare con l’orso, se non vuogli esser morso” (Don’t play games with the bear if you don’t want to be eaten). On his way to Padua, he passes through Ferrara, where in the main piazza by the prince’s castle he is accosted by a gigantic German knight. The German, who is a bit tipsy, is incensed to see the diminutive Florentine bearing what he claims are his, the German’s, own arms and so he challenges the Florentine to a duel. The Florentine, however, can see no point in coming to blows and arranges a deal through his seconds. “Let’s settle this with florins and put honor aside, he says. If you want me to go on my way as I came, I’ll be off right now; if you mean that I shouldn’t bear his crest, I swear by God’s holy angels that it’s mine and that I had it made in Florence by the painter Luchino and it cost me five florins; if he wants it, give me five florins and take the crest away.” The German, triumphant as though he’d conquered a city, paid up willingly. The Bardi knight went off with his five florins to Padua, where he was able to purchase a new crest for only two florins, making a clear profit of three. This little piece of buffoonery gives us a good idea of what knighthood had come to mean in the minds of many Italians by the late fourteenth century. For the Florentine judge, his knighthood was an honor which gave him the opportunity to dress up in a dazzling costume. It was a piece of merchandise he had purchased; nothing more. He had no sense of shame at his lack of bellica virtus. Nor was he an isolated character, at least in the literary imagination. The theme of the decline of knighthood was, as a matter of fact, a common one in the literature of the period. In the Corbaccio of Giovanni Boccaccio the knights of the time are depicted as “poltroons spangled with pearls and draped in ermine, decked with gold spurs and sword with gilded hilt, yet with as little appreciation of true knighthood as the devil has of the cross.” The jurists were as acerbic as the novellists on the subject. 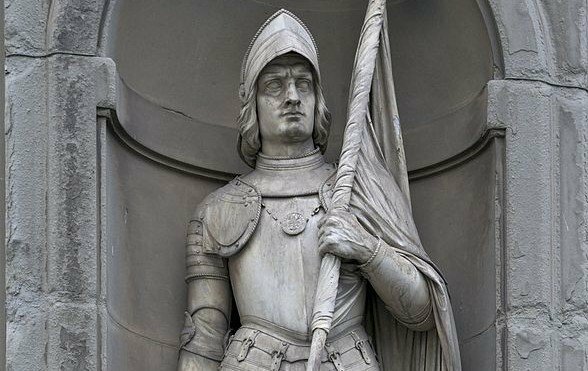 Cino da Pistoia criticized “pseudo-knights who were immersed in their profits and scarcely knew how to gird on a sword.” They enjoyed the prestige and privileges of knighthood without having any of the military responsibilities of the order.